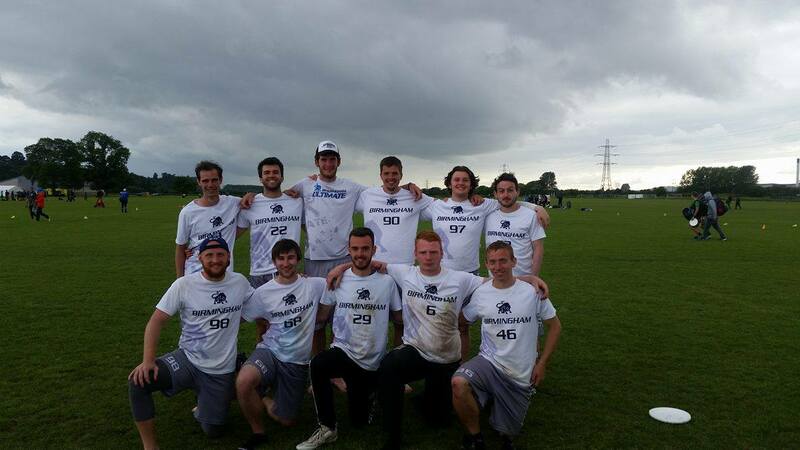 After a fair bit of player turnover from last year we started the weekend seeded 23rd (7th in B Tour) in a pool with a Cambridge side that only just missed out on an A tour start, a horrendously under-seeded half of the Ireland U24 squad and a dangerous Camden team who would be looking to cause upsets despite being seeded towards the bottom of B. We opened the weekend against Camden 1, not a team that we knew a lot about aside from their seeding. We started a bit complacently and they seized the initiative by taking an early lead. Despite battling back onto level terms we let them dictate the game too much and never really imposed our style on them. Lots of long, scrappy points ensued in the crosswind and a late break by them saw them take a 8-10 win. Next up were Cambridge 1, a familiar opponent with a somewhat unfamiliar looking team, we went into the game a lot more focused and immediately looked more dangerous. We traded for the first few points before stepping up the pressure with some zone D into the now trademark Nottingham wind. It was also about this time that Nick realised he could fly. On the back of some big turnovers we started to build ourselves a lead and took the game away, it finished 12-6 to us. The final pool game was Ireland U24s, and given our similar experience last year with Pelt and Ranelagh both being seeded much lower than they should have been, we knew what to expect. We did not help ourselves, but they also didn’t disappoint. We struggled to contain them and the racked up the score in the first half before we managed to slow them down a bit in the second. As much as we managed to slow them down, we weren’t able to generate many turnovers and the score kept ticking over, ending in a 3-15 loss. They went on to finish unbeaten in 9th. In the other final game of the group Cambridge beat Camden by 2, so the three of us finished in a three way tie for 2nd behind the Irish. Thanks to our bigger win over Cambridge we came out on top to take 2nd. That meant we maintained our 23rd seed, avoided a cross down and earned an early finish. Coming 2nd in the pool also put us into the top half of B Tour, with our first game on Sunday against someone who had lost in the A Tour crossovers. Typically, it worked out that it was KaPow, boasting a familiar face and subsequent insider knowledge. As we have done in the past against the ‘bigger’ teams we started slowly and let them take a lead before really believing that we could compete, they took the first half 8-2. After regrouping at half we started to put some pressure on, our zone working well to slow them down and make them work for every point. Our offense also started to flow better but unfortunately we had already given away too much by this point and they saw the game out, 8-13. Our penultimate game was against Vision, boasting a relatively large squad with a good mix of experience and young legs. By this point in the day the wind had picked up and this was a full on upwind-downwind battle. We started well, getting multiple turnovers on their downwind O points but we couldn’t convert the crucial upwind break. Our zone seemed to be working well too, until they suddenly started clicking and worked it up the pitch for an upwind break! At this point we showed great resiliency; we took our time and walked it up for an upwind break of our own, then got the downwind break to get straight back on serve. We were still making them work for the downwinds and the pressure told eventually as we got a second upwind score to take the break into half at 8-6. The long points so far meant that there wasn’t long left, so we knew that a few points hard work would probably be enough. Straight out of half we converted our downwind O point, before getting a third upwind break and the final downwind to take an 11-6 win. Our final match of the weekend was against LLLeeds. It was a funny start to the game as maybe 4 of the first 5 points were scored upwind… Luckily we started really well, racing into a 6-1 (?) lead and keeping the pressure up until half. After that though they stepped up their game as our legs began to tire. They kept chipping away at the lead and it was suddenly anyone’s game as we approached the buzzer. Mercifully it came in time that we were able to mount a final push to get us over the line, eking out a 14-12 win to place us 5th in B, 21st overall. So, despite an unconvincing start we managed to slowly build the momentum and really show what we could do by the end of the weekend. Now we need to take this momentum on to Tour 2 in a few weeks’ time!